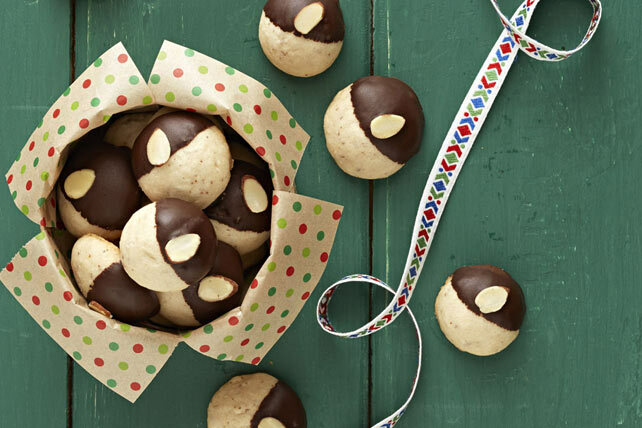 Dipped in chocolate and sprinkled with almonds, our Mexican wedding cookies are yummy, lovely to look at—and easy to make! Reserve 48 nuts (about 2 Tbsp. ); process remaining nuts in food processor or blender just until evenly ground. Beat butter and sugar in large bowl with mixer until light and fluffy. Blend in ground nuts and vanilla. Gradually beat in flour until blended. Shape dough into 48 (1-inch) balls. Place, 1-1/2 inches apart, on parchment-covered baking sheets. Bake 14 to 15 min. or until bottoms of cookies are lightly browned. Cool 5 min. on baking sheets. Remove to wire racks; cool completely. Melt chocolate as directed on package. Dip cookies, 1 at a time, halfway into chocolate; place on parchment-covered rimmed baking sheet. Top with reserved nuts. Refrigerate 30 min. or until chocolate is firm. Instead of dipping the cookies in the melted chocolate, drizzle the melted chocolate over the cooled cookies. Then, top with reserved nuts as directed. When grinding the nuts, do not overprocess them or you will end up with nut butter.